If you’re like me, part of you wants to be one of those moms who’s organized enough to make all those adorably sweet Valentine’s Day cards and crafts that you’ve pinned on your “Valentine’s Day” board. How can you possibly remember to buy all the measuring rulers and then print out the cute “you rule” cards in which to wrap them before the big day? It practically feels like you just got reorganized after the holidays and suddenly it’s time to be turning in all 20 cards to school. So, you end up taking the easy way out and throw the Ninja Turtle cards into your cart on your way out of the drugstore. You force your kids to write their name 20 times the night before their due date and you call it a day. Sound familiar? My memories of creating Valentine’s Day cards as a kid still remain pretty clear in that dusty old mommy brain of mine. I know it never involved hours of labor and lots of money buying trinkets and embellishing them with photo-ready labels. In our day, all you needed was paper, doilies, glue, markers, a sprinkle of glitter and a splash of imagination. That’s why this year, I’m ditching all the perfect, computer-designed cards and going old school. We pulled out the craft supplies and the kids made their own. I provided a little inspiration and then they rolled their eyes and created their own masterpieces. Yes, there was a glittery, gluey mess, but it kept them occupied for a whole hour on a cold, gloomy winter afternoon. I’d rather have them use some creativity and take responsibility for making their own cards, instead of me doing it all for them. So let your little ones spread their cupid wings and have some good, old-fashioned fun with materials you already have flying around the house. Besides, what shows how much you care for someone more than a handmade, one-of-a-kind valentine, even if it isn’t perfect and clever. Having trouble getting inspired? Here are a few ideas we dreamed up to help get you started. With a bright burst of color for a drab February Valentine’s Day, this card is perfect for even the littlest artists. On your computer or using markers, write out the message of your choice, using rainbow colors, if you prefer. Then cut the paper down to the size of your liking. Preschoolers can use the Do-a-Dot markers to create a rainbow of dots. Or, you can help them by dipping each finger in paint or coloring each finger with the ink from the markers. Then, create a rainbow. Create a cloud out of glitter or with cotton balls, or cut out a yellow heart to make it into a sun. Finish by signing each with your child’s name. This card is a special one that’s perfect for your child’s teacher or could even be framed as a keepsake for Grandma and Grandpa. Start by folding a piece of 8.5×11-inch construction paper in half, creating a card. On a separate piece of paper, trace around your child’s hand and wrist. Cut out the handprint and using the glue stick, press it onto the front of the folded card. Now use the small foam hearts to create flower shapes. We used three hearts for each flower. Glue the hearts down to the paper. In the center of each flower, glue a small decorative cotton ball. Using a green marker, draw the flower stems to appear as though the hand is holding a bouquet of flowers. You or the child can write their name at the bottom of the hand, along with their age or the year to remember it when looking back. On the inside of the card, write the message of your choice. We stuck with the classic “Roses are Red” poem. An oldie, but a goodie. This one is simple enough for a preschooler to participate. Older children can get creative and create various bugs, including butterflies or ladybugs. Using the paper cutter (available at craft stores), cut out many paper circles using the paper color of your choice. Or you can cut them out by hand by tracing around the bottom of a small kids cup and then cutting out the circles. Using the glue stick, glue together five circles by placing a bit of glue only on a small portion of the side of the circles. Place the final circle up slightly higher for the caterpillar’s head. On the head of the bug, glue two wiggle eyes and use a marker to make the nose and mouth. Cut the pipe cleaner in half, then fold one piece in half again. Use the end of your marker and curl the pipe cleaner around it at each end. Glue the center point of the pipe cleaner (where folded) down to the back of the head. 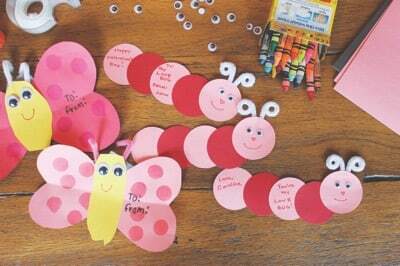 Write your Valentine’s message on the body of the love bug. Using the paper cutter, cut out many circles in the color of your choice. Next, cut out triangles for the ice cream cone. Paste the ice cream scoops together and on top of the cone. Glue a small red heart on top of the ice cream to make the cherry on top. Write your message on the scoops or on the cone. Ashley Weingart is the mother of three young children and she's always running somewhere. Whether she's chasing after her two-year-old with her craft scissors in his hand, hurrying to get dinner on the table, rushing to finish yard work, or literally running for exercise, she's always on the go. Many of her favorite daily tasks have something else in common; scissors, or sKissors as her littlest one calls them. Garden scissors, kitchen scissors, craft scissors, children’s safety scissors, she's nearly always got one of them in hand. Her blog documents her adventures as a busy mom on the run making time to have her fun. Visit www.runningwithskissors.com. Ashley is on Twitter @RunningSkissors and Facebook at Running with Skissors.